​What is a dual fuel range? A dual fuel range is a range with, as the name suggests, two different fuel types. The vast majority of dual fuel ranges are comprised of a gas stove and an electric oven. This combination of heating combines the best of both worlds of the two cooking methods. There are various methods of cooking that achieve more or less the same result. Heat is heat, after all. However, there are some methods that are more widely favored than others. In some instances gas is the preferred method, while in others it’s electric. The preference for gas or electric is somewhat subjective but there is a general consensus on what their strengths and weaknesses are. You can explore the debate in more detail in our article gas range vs electric. It's important to define the terms above since the terms stove, oven and range are often used interchangeably but technically that’s not the case. A stove is usually made up of several burners for surface cooking like frying or boiling. An oven is an enclosed compartment which is filled with concentrated heat that can be used to bake, roast or broil. The term range is often incorrectly used to refer to one of these components, but is actually the combination of the two. In general, most chefs prefer gas for their stoves and electricity for their ovens. Gas stoves are preferred by many home cooks as well for several reasons. Gas stovetops heat faster and can be more precisely controlled. Many also like the fact that looking at the flame size gives a good indicator of how much the pan is being heated. 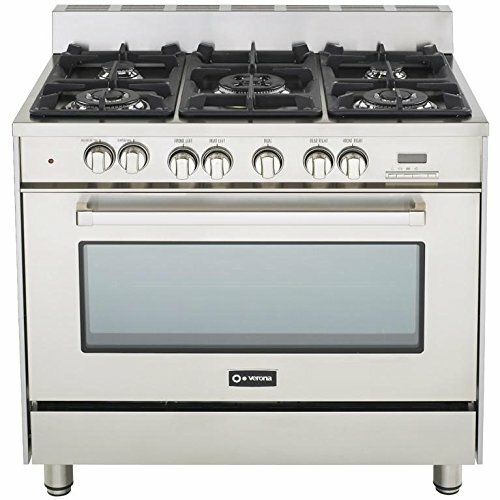 The above is a combination of gas and electric cooktop. With gas ovens, food on one side can be cooked perfectly but on the other it can turn out burnt. The main advantage of an electric oven is that they cook much more evenly. Electric ovens also have the ability to reach very high temperatures. This can be a useful feature when cooking certain types of foods. So there should be no worry about not getting a proper amount of heat. This also allows for electric ovens to have self-cleaning features, in which the oven locks its door and raises the temperature so high that any remaining food or grease is heated to the point to where it is turned into ash. If you’re interested in getting started with a dual fuel range, then consider the Verona VEFSGE365NSS. This is a high quality range available to the average consumer. It has five gas burners, giving you heat quickly whenever you want it and precise heating adjustments. It has a 16,000 BTU power burner in the middle to accommodate larger pots. These burners disperse heat not just around the edges of your cookware, but also directly on the bottom so that heat is spread out more evenly. Due to their costly components and complex designs, dual fuel ranges have come at a high cost to the consumer. Up until recently, they were only available to those with large budgets and were made by just a couple of exclusive companies. In recent years they have become more accessible to the average consumer and more manufacturers are making them now. However, they do still remain out of reach to many consumers. Once again, the way you cook your food is subjective, but there’s also good reason for why accomplished chefs, whether they be professional or not, prefer gas stoves and electric ovens.